Every once in a while, someone makes the assertion that I am a talented writer. Even more every once in a while, that someone is not my mom. And then, yet even more every once in a while, I get the question of why I basically only write about Trader Joe's products, and not things like politics or social issues or other weighty, important muckity muck like that. Easy. We all need a break from that. Just check your Facebook newsfeed. And just consider me pretty hesitant to add yet another clamoring voice to that festering noise pile of opinion, when really, at the end of the day, I'll either agree with you, or we'll balance each other out, so either way we're good in my opinion. Let's talk happy stuff like food instead. Much like that frusta, all the cheeses in this spirally guy just kinda melt all together in an indistinguishable meld. And instead of cheesy, I'd say it tastes more salty and perhaps even gritty. I know for sure what gouda is supposed to taste like - not there. And I've been to enough Greek food festivals to be confident that I'd be able to identify the others, even if I'm not 100% sure what either "semi-hard" (flaccid?) or "blue" (not "bleu") cheese is...and no feta? Hrmmm. That's not quite all, either. 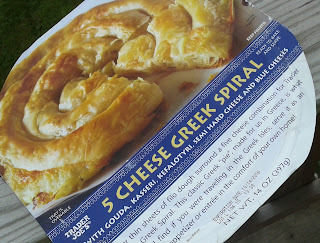 The phyllo roll seems to be one long, long section of dough sheets rolled up, but no base to hold them together, so cutting the pie-shaped section like the one picture on the box front results in multiple crescent-shaped sections. Plus, while baking in the oven, the whole thing was just kinda spewing out grease and stuff, which dampened my enthusiasm somewhat. It's not like that should have been unexpected, but still. The end result is a greasy, crispy, kinda bland, yet kinda salty dish that would be okay alongside some other, more successful Greek-inspired TJ's products, but don't make this one the star of a Greek feast. Not too much else to say. Sandy seemed indifferent when we ate this about a week ago, so I was surprised when she decided to give it a four. "Just so crispy!" she exclaimed. I'll give it that....but not much else. It takes a little more to get my zorbas dancing. Wow, I am so disappointed. I hoped this would be good. Baked, flakey, cheesy....how could Trader Joe's go wrong?! It wasn't bad, but yeah, coulda been a lot better. So much promise! Just cooked this up, baked it in the paper dish per the instructions. When I took it out of the oven (medium-browned like the pic), I poured several spoonfuls of grease out of the cooking dish. And put a paper towel under the ring as it cooled. It's not bad: pastry is flaky and cheese/pastry balance is good. the cheese isn't distinctive. I think it's easier to serve by unpeeling and tearing off sections of the roll, rather than cutting it as wedges (that will fall apart). And I recommend baking it on a wire rack, with a pan under it to catch the grease! Oh no! 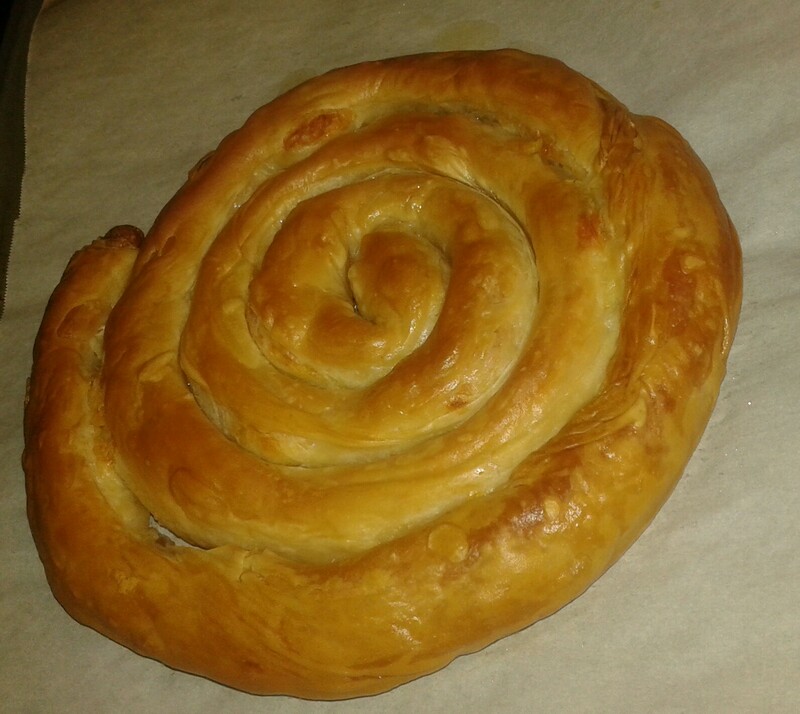 I've been craving Turkish borek and thought this could be a good substitute. Sad to hear it's not that great. I'll just keep to my memories for now. I thought it was tasty - and topped with olive tapenade a pleaser. I'm a little bit of a foodie, so you are harsher than this spiral calls for in your review. I had this several weeks ago, and my experience was similar to stevenp. Very very greasy. Wouldn't think you could possibly go wrong with this combination but it was very underwhelming :-( I poured a bunch of honey on it - helped a bit but still not all that tasty. Bummer. Kasseri and kefalotyri are both very good, and salty cheeses (like most Greek cheeses). Kefalotyri is a drier hard cheese, while kasseri usually has a good melt factor and is a little oily/greasy when melting. This probably contributes to the greasiness most people observe. 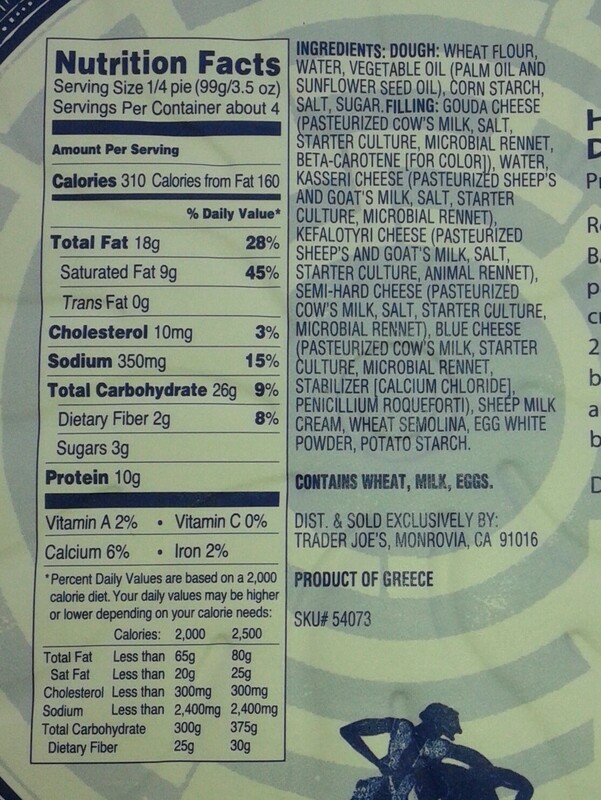 I am disappointed though there is no feta, but many frozen Greek pastries do not use good quality feta. Having had many pitas (spanakopitas, tiropitas (cheese pitas), etc), I think this one is pretty good actually. It is a bit greasy but to each his/her own. I would purchase this again! I agree that this was a disappointment. I was expecting cheesy phyllo goodness. It's so greasy and not cheesy enough. Totally disagree with this review. This is one of the best, tastiest items I buy at Trader Joe's, where I have shopped for many years. Try it yourself, if you haven't yet. 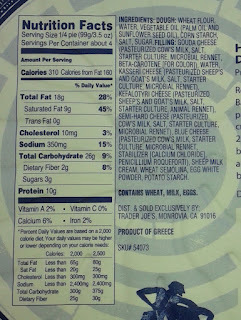 My partner's Greek family (like born in Greece, first language is Greek, will-not-eat-any-yogurt-but-Fage Greek) loves this! His mom says it reminds her of the tiropita they eat in Greece. I have such a fondness for it, too! I just had the 5 cheese Greek spiral. It was WONDERFUL. Beauitful flaky crust. I am going back to the store next month and buy a case to bring home. We need ab traders joes in our city. The crust was great - flakey and perfect. The cheese was just... an amalgam of cheese. Nothing to break it up. It definitely needed a dipping sauce of some sort to break it up. I liked this dish. Thought it was very delish. Definitely drizzle honey all over the top, could even sprinkle with toasted pecans and fresh rosemary too-it's so delish! Good the first day and the second day as well. LOVED IT.